The Miami Dolphins are taking on the Dallas Cowboys in the Pro Football Hall of Fame game in Canton, Ohio, on NBC, and Miami's new NIKE uniforms are a hot topic on Twitter. This brings to mind the looming changes to the Denver Broncos own uniform. During the team's scrimmage at Sports Authority Field at Mile High on Saturday evening, players welcomed fans to the stadium on Thundervision—which underwent a $30 million upgrade this summer—while sporting solid collars. 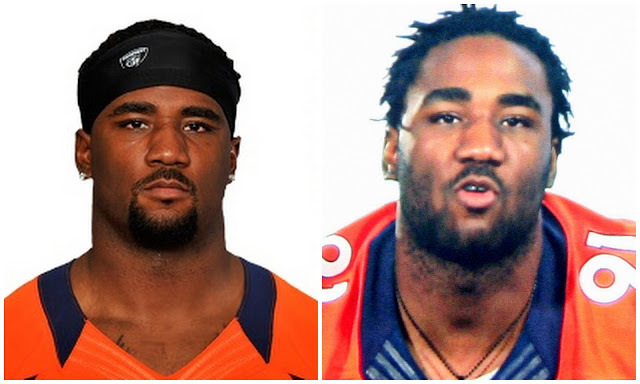 Below is a before (left) and after (right) of defensive end Robert Ayers in 2012 and last night on the team's Thundervision scoreboard. When NIKE took over as the NFL's apparel provider last year, they implemented a fang-like collar, which many teams appear to be dropping this fall. On a related note, Ayers seems to have put on some weight since last season, at least in his face. On the team's official website, Ayers is listed as weighing 274 pounds. Ayers is currently listed as the team's starting right defensive end on the depth chart. Ayers, a 2009 first round draft pick, recorded two sacks in a rotational role on Denver's defensive line last season. Expect the Broncos to debut their new collars on Thursday when the team travels to San Francisco to take on the 49ers in their first preseason game of 2013 ($10 tickets here).